I am needless to say over the moon with my 5-star rating awarded to the Bonaforte Irish Wolfhound Kennel under the new Defra Regulations. On the day of the inspection, we spent three and a half hours and answered 47 sheets of questions, including providing extensive documentary evidence, and it makes complete sense because at the heart of it are the dogs and the puppies welfare, and for this reason alone we all need to be embracing this change. It's the beginning of a considerable change for breeders of any kind, and one we should all welcome, if you breed, even one litter, make a profit, or have a stud dog and make a profit you will eventually need a licence. There are so many caveats attached at the moment, but they all seem to be pointing in the same direction, breed one litter, advertise, make a profit, and you need a licence, and a licence number. Follwing the link below to read more on the Kennel Club website. Crufts 2019- aka "Bonaforte Party Time"
Well, Crufts 2019 has been and gone and as always the actual day was as good as the anticipation. Of the 139 hounds entered we had 4 Bonaforte hounds across the classes sadly Hugh and I couldn't attend, but what was simply fantastic was the non-competing owners made their way to the NEC to offer support and catch up with everyone. Thank you very much for the show of solidarity from the Bonaforte family We have long believed that we have the best owners and this kind of camaraderie extends across both showing and non-showing owners, supporting each other at these events. It is one of the things that gives us the most pleasure as this love of the breed forges genuine strong friendships. Hugh and I were kept updated throughout the day with photos and videos from ringside with everyone saying what a lovely atmosphere there was. Although for the most part, we weren't the judges choice Bonaforte's Opulence with CladdaghWolf -Rupert with Amanda was VHC in a strong PGD class. We are delighted with this beautiful hound, not only for his elegance and graceful movement but also for his fabulous temperament. He was a perfect breed ambassador the whole day. Carl and Rupert getting mobbed by vast amounts of people and he had a kiss or lick for everyone. One gentleman in particular who was in a wheelchair declared Rupert his “dog of the day” which Amanda and Carl said meant more than his card. Ava Bligh was 1st in Good Citizen and Elsie Bligh 3rd in Good citizen and not many Wolfhounds actually manage to qualify via good citizen so its credit to Helen's training, that she now has a mother and daughter team. Well done Helen. Bonaforte's Meldrew or Baby A and Julie, what can we say about this lovely duo. 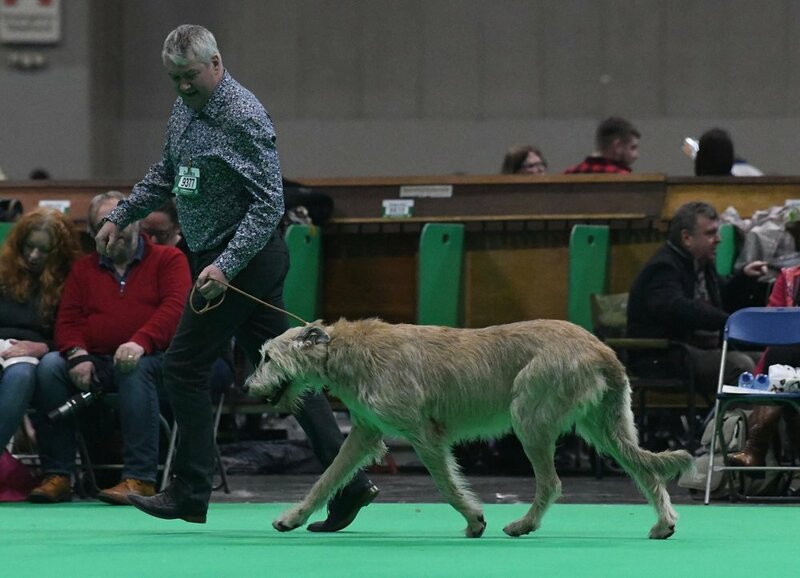 Being their 1st Wolfhound Julie decided to have a little go at showing, and this was her 2nd Crufts!! They are both simply personality personified-if ever a hound was matched to the perfect owner then these two are it. Both as mad at each other with a massive sense of fun! As a breeder, it is so gratifying to know and see the difference your puppies make to people's lives, and Julie's Prosecco Cupcakes are becoming legendary!!! Bonaforte's Pourquoi very nearly ran the legs off Sharon such is her speed and stride. 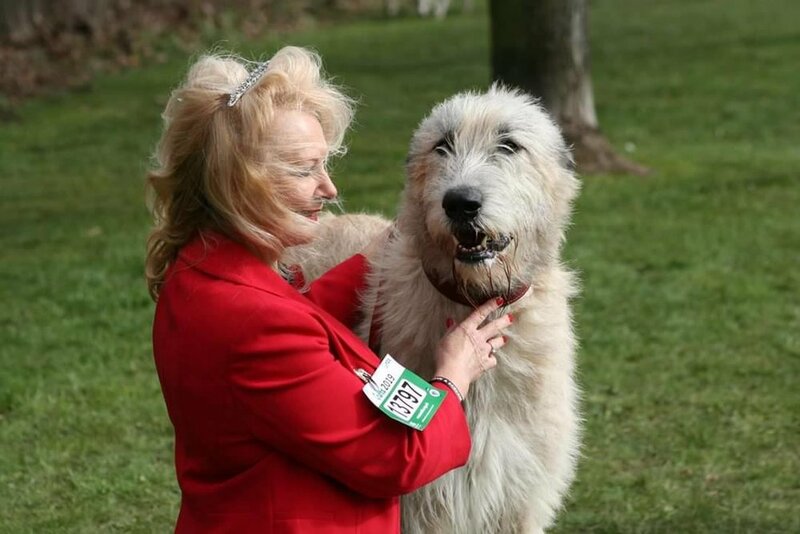 What is also really nice to see is her love of children, so many people come to the benches to meet Wolfhounds and Porky is in her element being fussed and adored. 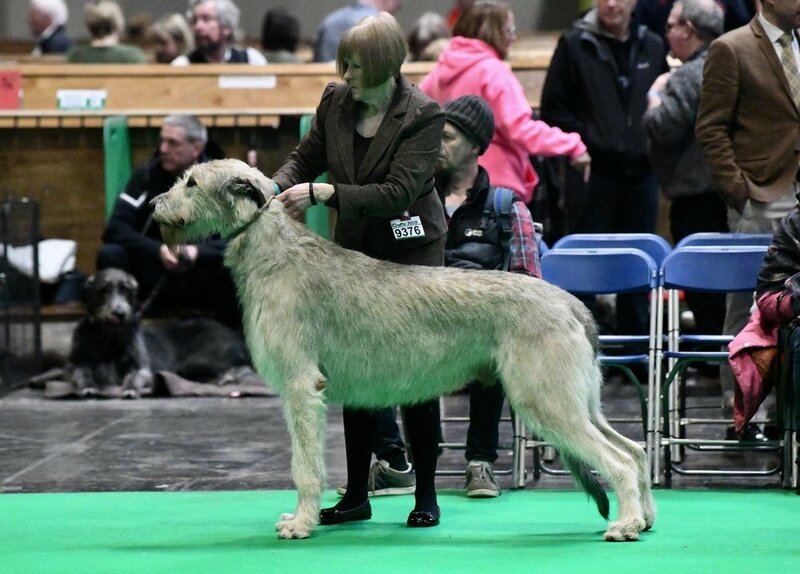 Not forgetting our own Bonaforte's Ophelia, shown by Linda she moved with grace and power, loving the indoor hustle and bustle and to us captures the Wolfhounds' true movement. All our owners said what a lovely judge Roger Tebbutt (Caredig) had been, gentle with the hounds and giving every single dog his full attention which is exactly what is needed, especially when Crufts can be quite overwhelming. Of course, would Crufts would not be Crufts for our owners without the necessary party. 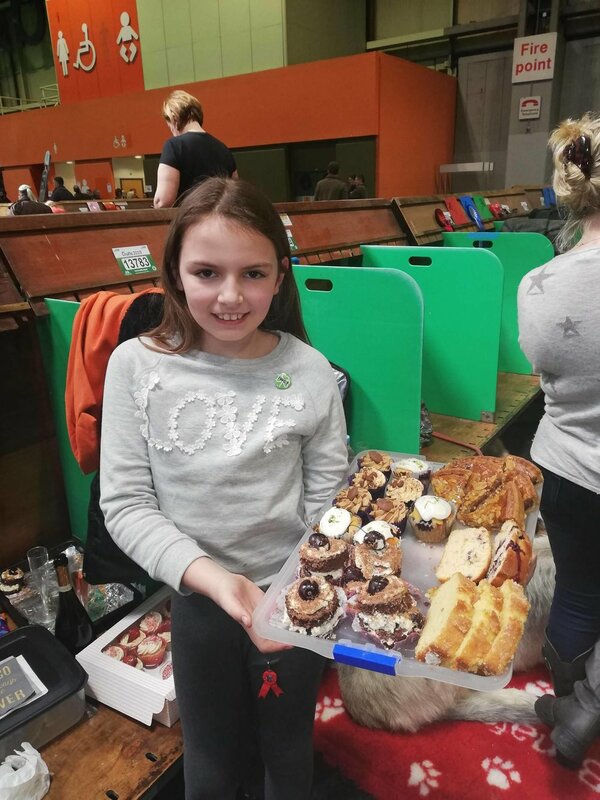 Vast amounts of cakes were baked for the occasion, and SkyeBear was dispatched both ringside and benches to offer some much needed sugary goodness to one and all. Of course, Crufts is a dog show, but for our owners and us, it is also an opportunity to let people meet and greet this beautiful breed. 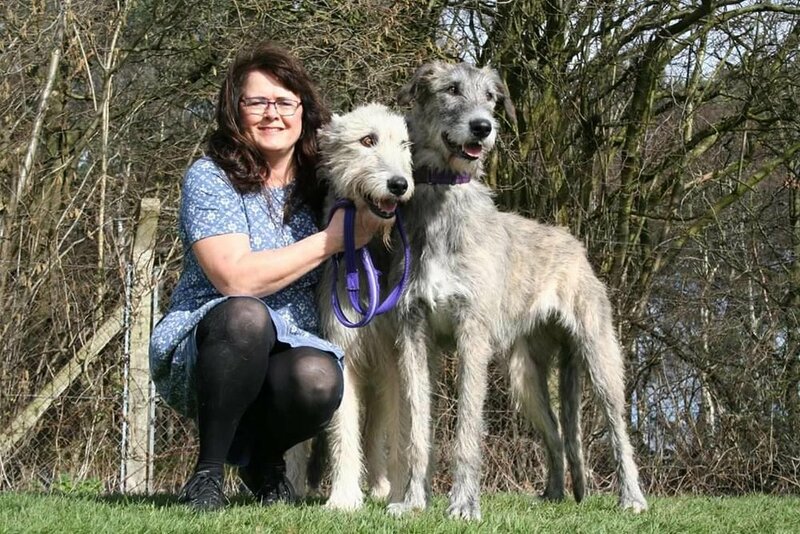 If Wolfhounds are to survive in the 21st century, then people need to see them as fit and healthy and happy dogs, and we are delighted that all of our owners and hounds are perfect breed ambassadors. 20% off until 31/3/19 using discount code: "Stpatrick1"
Hydrate+ For Dogs Specially formulated hypotonic drink designed to quickly replenish, fluids, minerals, glucose and the nutrients dogs need for optimum hydration. Made with a 100% natural chicken flavour your dog will love, it encourage them to readily drink when needed. Contains prebiotic fibre GOS+ to support a healthy gut. Ready to serve, requires no dilution in water. Working/active dogs, hot weather, travel, whelping recovery and more. The Homestead Horse & Hound Hoedown in association with the IWCT. What a great day the video says it all and a huge thank you to all the Bons who made this day a fantastic success and to all those who joined in the fun. Thank you and hope we have more of this next year IWCT for an action-packed re-play! Well done. What are the benefits of a grain free diet? Results of Grain Free diets have been reported by vets in some cases to help reduce various symptoms. Complex Carbohydrates such as Potato and Sweet Potato, used as an alternative to grains, provide slow releasing energy which helps keep pets fuller for longer. 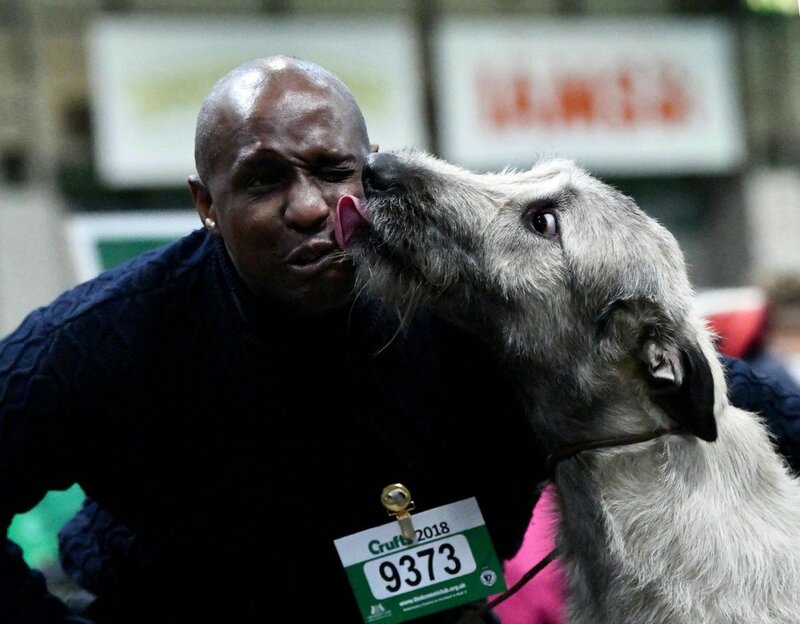 How to sum up this year at Crufts: What a Fabulous Atmosphere, camera, action, cakes, fun and friendships and a day full of laughter, add to that 166 Wolfhounds and it's true to say it was a delightful and memorable day for all. On a more solemn note, our thoughts and prayers are with you Chris and your family at this sorrowful time. Despite the recent and sad loss of a family member, our breed specialist Chris Amoo put on a brave face indeed. 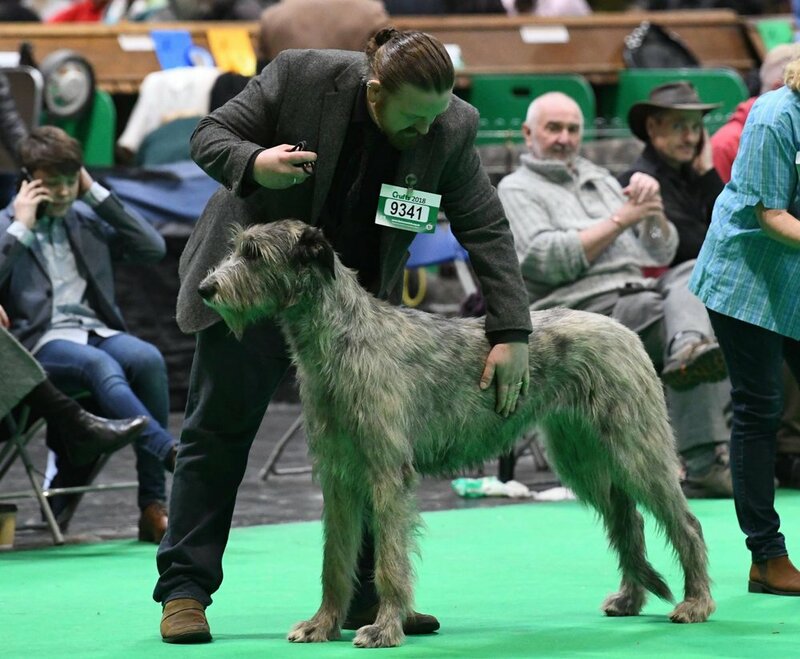 Drawing a very well deserved huge entry from both UK and the continent including 9 Bonaforte Wolfhounds and although it wasn't our day in the ring all our owners who exhibited said how very kind and gentle he was with all the hounds. Our beautiful Creamy (Ice Cream von der Oelmühle) came out in veteran for her last showing with Neil. We were so proud to see her powering around that big ring- the matriarch of the kennel. She had 2 of her sons showing on the day Anthony and Penny's Harker (Bonaforte's Amadeus) and our very own Bertie, (Bonaforte's Earl Grey) Our thanks to Maggie Holder for handling Bertie to 3rd place in a very strong limit class. These two have such a unique bond, and Bertie instantly recognises Maggie's empathy. Continuing the family theme and to our delight two of Creamy's grandsons, Norris (Bonaforte's Odyssey) and Rupert ( Bonaforte's Opulence with Claddaghwolf) and her granddaughter Bonaforte's Ophelia was having her first outing, handled by Linda and what a fab pair they made. Julie and Arthur (Bonaforte's Meldrew) deserve special mention as despite only starting showing last summer they proudly took their place and it was great to see them confidently powering around the ring. The Show Stopper is always Phil's Jacket, as we all waited with a sense of excitement for the unveiling of the show jacket and he didn't let us down. A particular eye-catching green shamrock themed jacket and tie meant that he and Stan (Bonaforte's Justice) caught everyone's attention in the ring. It is to Phil's credit that not only does he show Stan to perfection he does it with his sense of style and fun! Then came the girls -Kenzie (Bonaforte's Kensies Kisses) who just adores Dave and this shines through at every moment. She is like a pocket rocket and puts Dave through his paces and Bonaforte's Luna giving Robin a real workout! We are so so proud of all of our hounds. They all moved out and looked powerful strong yet graceful, and as a kennel, they represented us so well. A very special mention too, for Ava (Bonaforte's Enchanted at Ravencrag and her delightful daughter Elsie (Ravencrag Helter Skelter) who both not only qualified for Crufts in their own right but also went the extra mile and qualified for the Good Citizen's Class - Helen Bligh you are amazing! To say there was a party atmosphere is to put it lightly -the Bonaforte Cake Ladies brought with them delicious delights. SkyeBear and Amy were dispatched ringside with trays heaving with cakes there was the pop of a cork or two to celebrate the fact that we all made it there and survived. Many thanks to our very own Bonaforte photographer, Hugh, for our lovely photos. Of course the group photo, a feat in itself to get all hounds and owners outside in the same place at the same time with some "guidance" from Amanda we now have a beautiful photo reminder of an exceptional day. A very special thank you to our Show Team leader Amanda Brown, Master of Roles (aka Julie Andrews) who skipped around the ring helping Helen with the girls, organised us all, including drafting this fab to write up. Thank you. Lastly a HUGE THANK YOU to the Family von Bonaforte ( following on in the Julie Andrews theme here) you are all very dear to my heart, exceptional owners and friends, united by our love of Irish Wolfhounds. Looking back yet another year is nearly over and how swiftly they seem to go these days. As usual, we have had our fair share of trials and triumphs –the sadness when any of us lose a precious Hound is intangible, and one of the comforts is the support we get and give each other as owners. Please take a moment and raise a glass to all those great hounds we have said goodbye to this year. You are all forever in our hearts. It is always good to see how our owners are always on hand for both ourselves and each other in times of need or great stress and this year the Porters had a very stressful incident with Eva who while out on a walk fell down a 5ft dry dyke. Alan was alone walking her and her sister Abi, and we can all imagine the horror of looking over the edge to see your precious hound fully laid out and unable to move. A lot of help was given to get her out, and then the real battle began. She went completely off her feet, but a team of Bon owners and ourselves worked with Debbie and Alan With love and help, Eva with her tenacious spirit is up and charging around. Although she does rather like to sofa surf! It is a complete credit to the friendships and support forged that drove us all forward to get Eva back up and back to her old self-and we all enjoy the updates and the pictures of her just “being Eva.” We have to mention, Ann Dye with Ellie, only 22 months old has achieved The Kennel Club Good Citizen GOLD award. Well done. Pemba Bishop and her owner Ann-this year Pemba passed her assessment and is now a PAT dog-we are incredibly proud of this sweet girl and we know Ann is also-it is our aim and our personal choice to breed with health and temperament being the 2 most important factors and to see our Wolfhounds making a difference in peoples lives is so fulfilling for us as breeders. Of course, we also have a very creative bunch of owners, and the Easter Bonnet Parade shall long be a favourite memory. Alongside that some of our owners who have tried their hand in the show ring for the 1st time ever and have qualified their Hounds for Crufts. So that will be a riotous affair if we know our owners because wherever they go, you are sure to hear lots of laughter. Huge congratulations to Karen Cox, the winner of The Fortnum & Mason Frightfully Delicious Halloween Hamper. A massive thank you to you all for supporting the IWCT.